Wow… we celebrated Labor Day in the United States today. Didn’t I just say that about Memorial Day a few days ago? The summer has passed in a blink of an eye; seriously I don’t know where it has gone to. The days are getting shorter and if your kids didn’t start school yet, they will be heading back tomorrow or very soon. Our youngest child just started his senior year in college… but that is a whole other story. I love the thought that fall is right around the corner. I love the crisp air that fall brings, pumpkins… but the thought what follows does not thrill me much at all. Winter is just not my season. It makes me sad to think that soon the summer fruits will be a thing of the past, but for now I have been really enjoying all of the fruits that summer brings. 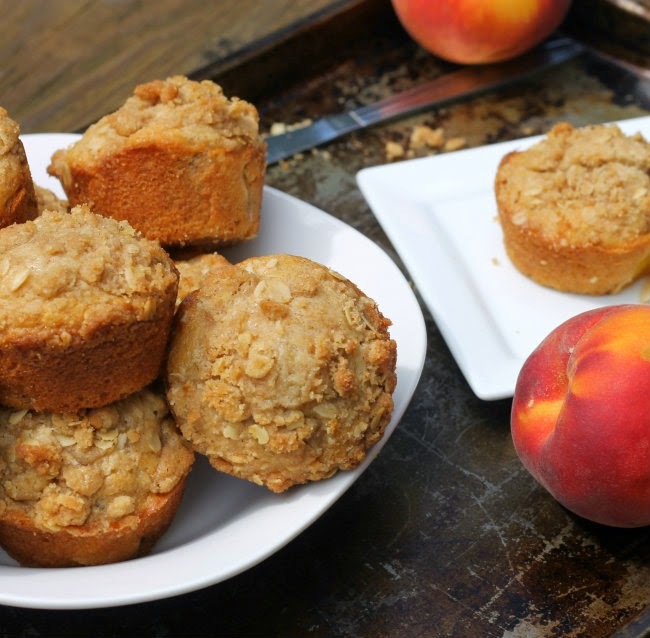 I had peaches sitting on the counter that were very ripe and need to be used like right now and since it has been a little while since I have made muffins it was an easy decision. 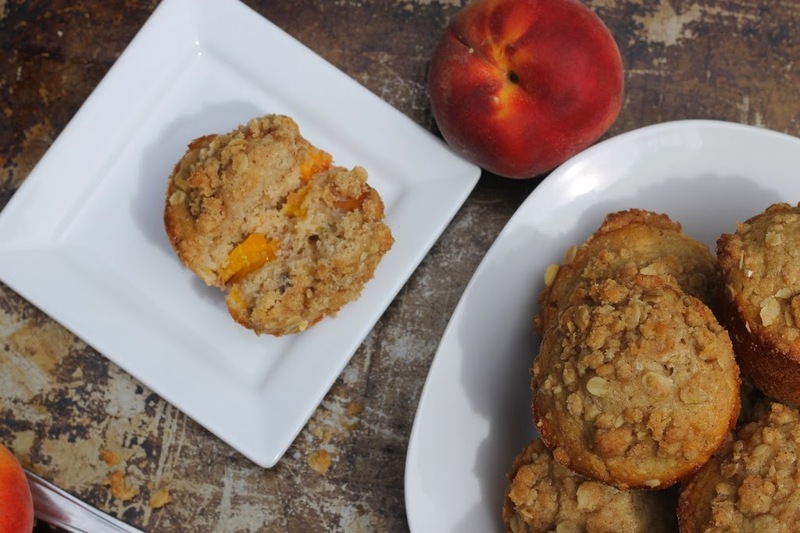 This is my first time making peach muffins, last year I tried my hand at peach scones and we loved them, so I was sure that we would love the muffins just as much. The muffins are wonderful. The peaches help with making them nice and moist. As with a lot of my muffins I add a little crumble to the top. I recently tried using oats in my crumble and loved it so I added some to this one as well. 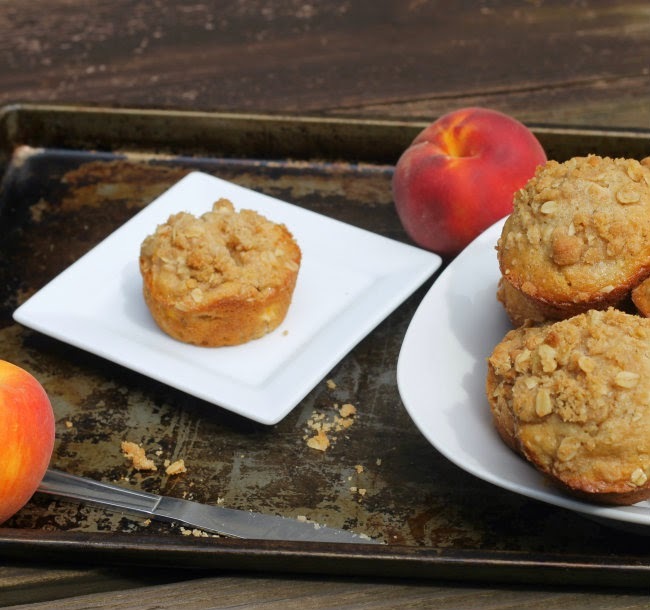 Looking for a simple muffin to use some peaches up… I hope you will give this one a try. 1. In a small bowl mix the dry ingredients. 2. Add the melted butter and blend with fingers until well mixed. 3. In a medium bowl slightly beat the egg and the remaining wet ingredient except for the peaches. 4. Add the wet ingredients and peaches to the dry ingredients fold until just blended. 5. Lightly grease muffin tins. Spoon in batter so that each tin is 2/3 full. Sprinkle about one tablespoon of topping over the batter. 6. Place in the preheated oven and bake for 12 to 15 minutes or until the muffins are lightly browned. 7. Remove from oven and set on cooling rack for about 5 to 10 minutes. Remove the muffins from the tins and set them on cooling rack to cool completely. I never get tired of trying new muffin recipes. Love the pairing of peach with the oats. Why hasn’t anyone told me about peach muffins! I love this idea! Really creative — thanks. Your muffin and a cup of tea would be a great way to start the morning.